Japanese cherry blossom trees are famous worldwide, and each year around April hundreds of thousands of people flock to the nearest sakura to experience their annual blossoming. They are iconic in their native island of Japan, and the oldest example can be found in Yamanashi prefecture. It’s called Jindai-zakura, or ‘The Cherry Blossom from the Age of the Gods’. The legend of Jindai-zakura starts around 2000 years ago. The story goes that it was planted by Yamato Takeru, a Yamato dynasty prince, toward the end of the first century AD. He performed a number of heroic deeds in addition to planting this tree, all of which are chronicled in the two oldest books of Japanese history, Kojiki (from 712 AD) and Nihon Shoki (720 AD). Although most of this is likely nothing more than folklore, the tree later had another run in with an incredibly important – and decidedly real – character. After growing for an already impressive 12 centuries, the tree fell ill. Fortunately for the tree, a Buddhist priest by the name of Nichiren was able to save it with a blessing. Nichiren went on to be a hugely influential figure in Japanese Buddhism. Nichiren Buddhism remains one of the largest religions in Japan, and some schools consider him a reincarnation of the original Buddha from times long ago. The temple next to Jindai-zakura, Jissou-ji, is devoted to this distinct branch of Mahayana Buddhism. Whatever blessing Nichiren bestowed upon Jindai-zakura, it seems to have worked. The enormous tree became the first natural monument recognized by the Japanese government in 1922. At the time, the trunk perimeter measured an incredible 44 feet (13.5 meters). The tree’s popularity only seems to have grown over the years. 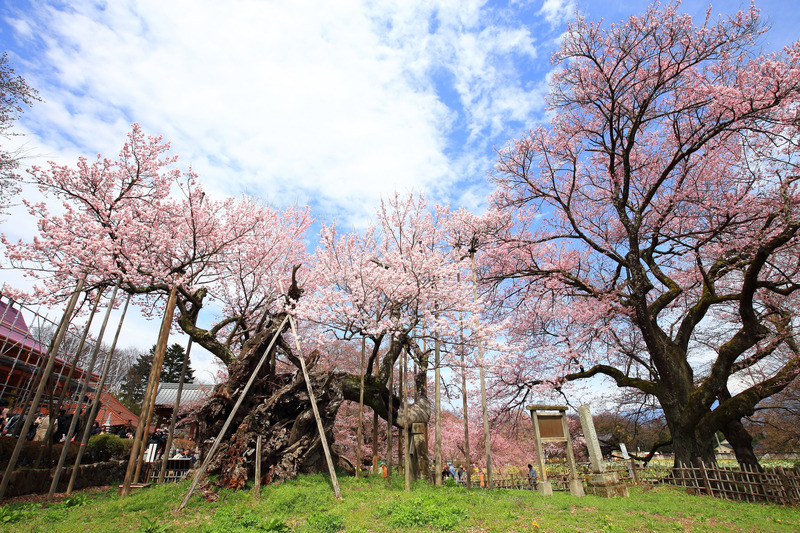 It’s known as one of the Three Great Cherry Blossom Trees (Sandaizakura), along with Usuzumizakura, a 1500 year old tree in Gifu, and Miharu Takizakura, another ancient tree in Fukushima. 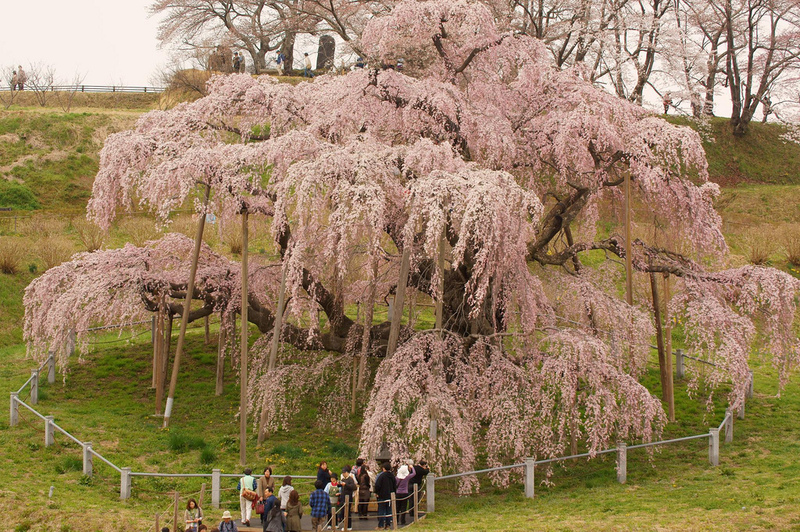 Neither of the other trees on the list can compare with Jindai-zakura. 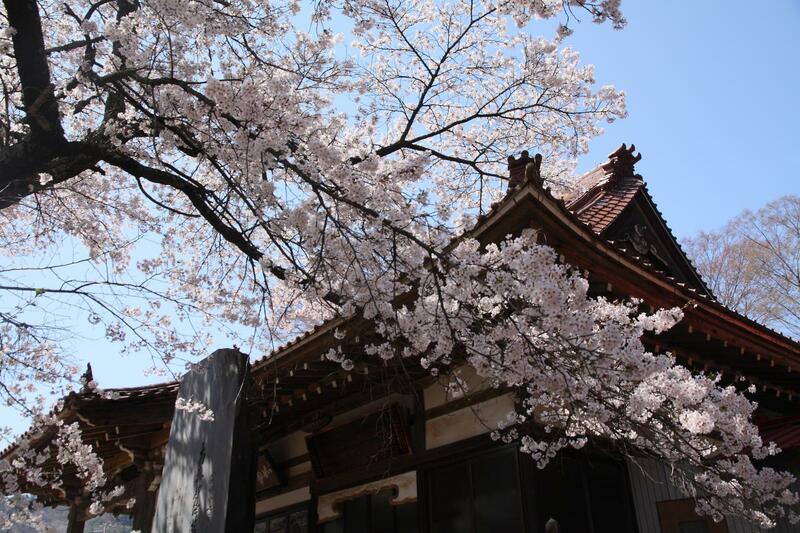 It’s recognized as the oldest cherry blossom in Japan, and it’s likely the oldest worldwide. Although some of its origin is shrouded in myth, its age is indisputable. When a snowstorm knocked down one of its larger branches many years ago, tree doctors counted well over 1000 rings. And that was just a branch. Like many ancient olive trees, the trunk is too gnarled and damaged to ever know its true age, but at the moment there’s no reason to doubt traditional estimates of 1800-2000 years. But the tree’s life hasn’t always been blessings and good fortune. Just over 50 years ago a bolt of lightning struck the tree, hollowing out the center of the trunk and giving it the gnarled shape it has today. Later on, the tree’s popularity was nearly its downfall. After receiving hundreds of thousands of visitors each year, the soil began to compact under the weight of the visitors’ footfalls. The situation got so bad around the turn of the century that the tree was in danger of dying. This time it was another Buddhist priest that would be the tree’s savior. Jikiju Matsunaga, the 31st head priest of Jissou-ji, came up with a plan of action in 2003. A skilled gardener, he oversaw a project that dug out all of the hardened earth around the tree and replaced it with healthy, fertile soil. A fence was installed around the tree to protect it from future visitors. The operation was a success. Although the tree has shrunk slightly from its 1922 size, it remains healthy today. Along with the younger, more vigorous tree nearby, it continues to erupt into a beautiful flowery display each year for just one week in April. After two millennia, that’s quite a feat. 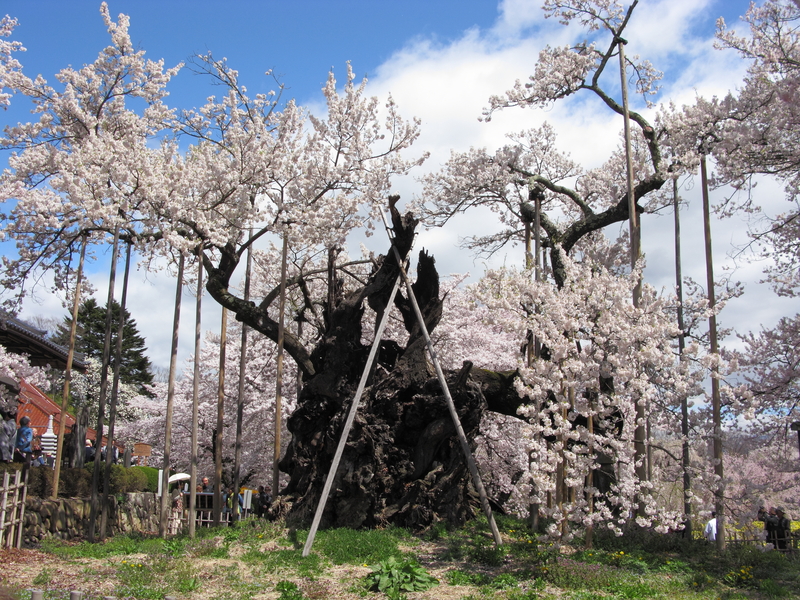 If you enjoyed this article about the oldest sakura tree in Japan, check out the archive for more amazing tree stories. Also check out the Facebook page, with a few extra tree goodies throughout the week. Subscribe below to receive notifications whenever a new tree story is published. Thank you for this informative article. What amazing trees and great shots too. Thank you for providing this little moment of peace and tranquility, whenever I receive notice of a new Treeographer blog entry. Thank you for these moments of peace and tranquility, whenever I receive a notification of a new Treeographer blog entry. Amazing. It’s bizzare to see something looking so withered by the forces of time bloom something so fresh and delicate. A natural juxtaposition. I’m quite startled by how many of the trees you’ve covered have been in trouble due to tourist overload. Had never considered that to be a problem before. That’s a great point! It’s incredible to think that each year, for the past 1800+ years, this tree has exploded in color for just one week. A full year growing and waiting for a single moment of fleeting brilliance. Sometimes I wish life were that simple. That is an impressive age for any tree, but especially for a tree that gets only about fifty years old here. There are two at work that must be removed, but no one wants to do it. They are not even sixty yet. 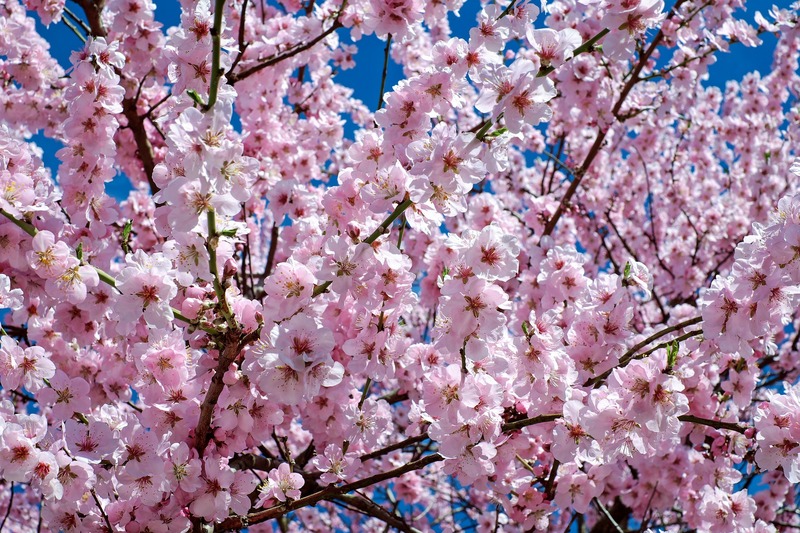 There are several 1000+ year old cherry blossom trees of different varieties in Japan. Not sure what gives them such exceptional longevity… maybe it’s the climate? They also industrialized much later and took care of the environment from early on. Cherry trees prefer that climate. They do not have it easy here. Even while they are healthy, they develop decay in open cavities caused by sun scald. It does not help that ‘gardeners’ do not know hot to take care of them. Excellent story, thank you. We’ve planted 4 Japanese Cherries in our yard. When I pruned them this spring I set out the sticks in a bucket and alerted my neighbors through FB. In the lingering days of Winter that refused to cede to spring there was a shared magic of forced cherry blossoms throughout our neighborhood. I cannot look at blossoms without think of Akira Kurusawa…such magic in blossoms.